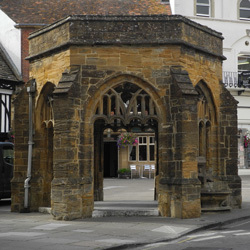 There are two Rotary Clubs in Sherborne. The Rotary Club of Sherborne was chartered in 1936 and the Rotary Club of Sherborne Castles in 1997. Both Rotary clubs meet weekly and carry out a wide range of community activities and charity work in and around Sherborne. 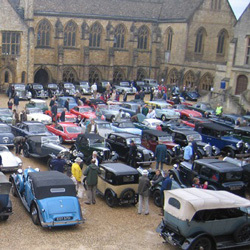 These range from providing the annual Christmas tree and crib on the Parade in Sherborne to holding the Historic Vehicle Rally each August in the Courts at Sherborne School. In addition both clubs support and assist the youth and elderly of Sherborne and the surrounding area through a number of initiatives. They also raise funds for many international charity causes and disaster emergencies. In 2003 the first Ironman 70.3 UK triathlon was held in Sherborne. A member of the Rotary Club of Sherborne took it upon himself to organise an arrangement whereby the entrants could raise funds for a charity through the clubs charity fund. Over the next seven years the number of triathletes raising funds continued to grow as did the amount raised for charities and good causes. In 2010 the Rotary Club of Sherborne Castles agreed to take over using its own Trust Fund whilst it considered the projects long term future. As a result of their deliberations a separate dedicated charitable company limited by guarantee was set up to take over all the activities. Incorporated on the 29th September 2011 the new charity was called Rotary Club of Sherborne Castles Fundraisers Limited. By this time the Ironman UK athletes were already known as Rotary Charity Fundraisers so it was decided that this should become the operating name of the charity. Once formed the trustees of Rotary Club of Sherborne Castles Fundraisers Limited set up a Community Fund within the charity so that a small fraction of the funds being raised could be retained to form the basis of an annual awards programme for local charities and good causes. The awards being made in April 2017 will be the fourth year of the operation of The Community Fund. Click here to read more about the history of Rotary and Rotary International today.